Dr. Michael Rosen graduated college as a double major from the University of Delaware where he earned a Bachelor's Degree in both Chemistry and Criminal Justice. He then continued onto Dental School at the University of Maryland where he earned his Doctorate of Dental Surgery. While at the University of Maryland, he was an inducted member of the Gamma Phi Delta Prosthodontic Honor Society, as well as a member of the dental school admissions committee. After graduating from dental school, he further enhanced his dental knowledge base and clinical skill set by completing a General Practice Residency at the VA Medical Center in West Palm Beach, Florida. During his residency he received advanced training in numerous disciplines in dentistry including dental implants, endodontics, oral surgery, prosthetics and restorative procedures. Dr. Rosen is an active member of the American Dental Association, the Academy of General Dentistry and the Maryland State Dental Association. As the Chair of the New Dentist Committee for the Maryland State Dental Association, he volunteers his time to help new dentists successfully navigate dental school, obtain licensure, and transition into jobs. In appreciation for his service, Dr. Rosen was awarded the New Dentist Leadership Award in September of 2017. Dr. Rosen also teaches part-time at the University of Maryland Dental School as Dean’s faculty. He is assigned to third and fourth year dental students and supervises their patient treatment in the clinic. Dr. Rosen enjoys giving back to the school, and understands how valuable it is for the students to learn from dentists in private practice. Dr. Rosen currently resides in Baltimore County with his wife Laurie, daughter Ruby, and their puggle puppy Bentley. When he is not in the office, he enjoys spending time with family and friends. Dr. Rosen appreciates living close to downtown Baltimore and frequently visits the Baltimore Harbor. He enjoys traveling, trying new restaurants and spending time outdoors. 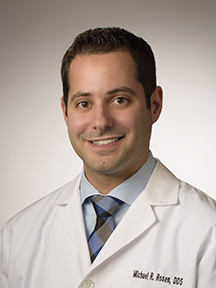 Dr. Rosen is also an avid runner and has completed numerous races including Baltimore, Philadelphia, and Disney Half Marathons.